Hi! 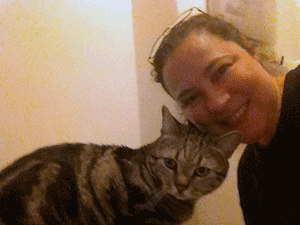 My name is Evelyn and I am a cat sitter for Katie’s Kitty. I have the pleasure of caring for kitties in the Manhattan area of NYC. By day, I am a speech/language pathologist working with 3-5 year old preschoolers with special needs. I’ve been involved in this wonderfully rewarding profession for 20 years now and intend to continue as long as I have functional vocal cords 😉 I love children. I would be happy to meet with you, free of charge, to discuss the possibility of me taking care of your cat(s) while you are away. I would come to your home daily, for a minimum of 30 minutes and I would change the water in the cat bowl, replenish the food, and scoop out the litter box as needed. Additionally, I would spend quality time playing with, brushing, and talking to your cat(s). Naturally, if your cat(s) prefer(s) to be left alone, I will respect their space. I also take pictures and videos of your kitties while you’re away and send them to you with detailed daily email updates. My clients say they love this because they get to see their cats everyday even though they are away. I look forward to meeting you and your feline loved ones! Read Evelyn’s reviews Yelp. You can also read more Yelp reviews about Katie’s Kitty pet sitters here. Contact us today to set up a time to meet your new NYC cat sitter!